Welcome to January and a brand new year. The holiday season has passed and winter is beginning to show in all its force. Need something to bring on the warm fuzzies and beat the winter blues? I know this is a controversial holiday for some, but as a girl I always loved Valentine’s Day and still do. The whole day was always so happy and filled with love, hugs, and sweet surprises from my family and friends. In school I had so much fun exchanging Valentines with classmates, and loved making a special card or gift for my mom. It made me feel so good to know how happy my gift made her. (Thanks for always loving my little gifts Mom!) And every year my grandpa would always give me and my cousins a heart-shaped box of candy - that always made me feel so special. Now as a wife and mother, Valentine’s Day isn’t always as glamorous. For one thing, Brian is not a fan. He feels like he's being forced into it and prefers to do nice things when the moment strikes him, not because the calendar says so. I understand that. But ignoring Valentine’s Day? That’s not me. As leader of the Valentine effort in our house, this winter weather makes me think about what we can do to celebrate love. With Daisy being a toddler now, I can start to show her what the holiday is all about. I’m thinking we’ll do a little craft, put some heart decorations around the house, and plan some fun activities and gifts for family. No matter if you and your partner exchange gifts, cards, or nothing at all, it can be fun and exciting to share this love-filled holiday with your little ones. Below are some fun ideas to inspire you. I hope some of them catch your eye and you try them out with your child this year. I can’t wait to have fun with Daisy and make Valentine’s Day a holiday she’ll always look forward to. Wishing you love and warm fuzzies this Valentine’s Day. We LOVE cookies in our house, and I’m not ready to say goodbye to the holiday cookies just yet. Why not bake a fresh batch with baby? Not only is it a fun activity to do together, it’ll be more exciting, tasty, and (potentially) healthier than chalky heart-candies and chocolate. There are endless options for crafting with your child for Valentine’s Day. You can make a heart wreath, a candy heart covered picture frame, or the go to - a paper hug. These all make adorable decorations for your home, and exciting activities to enjoy with your little one during this loving holiday. Store bought valentines can be great, but they can also be a bit impersonal. Take an extra step and help your child make them from scratch. Whether they’re going to classmates, siblings, or grandparents, everyone will enjoy the extra special touch of these hand- or foot-made valentines or toilet-paper-roll heart stamps. This is a super fun activity, especially if your child is still too young to be using scissors and glue. Instead of buying PlayDoh, pull out your red food coloring and the other simple ingredients found here. Let your child mix different shades, make hearts with cookie-cutters, and see what they come up with on their own. >>>Find heart-shaped post-its online here. Whether its for your own use or to send out to friends and family, everyone loves cute seasonal photos. Use any of the crafts previously mentioned as props, or go all out with a full on photoshoot like these babies did: Valentine's Day Photoshoot Ideas. 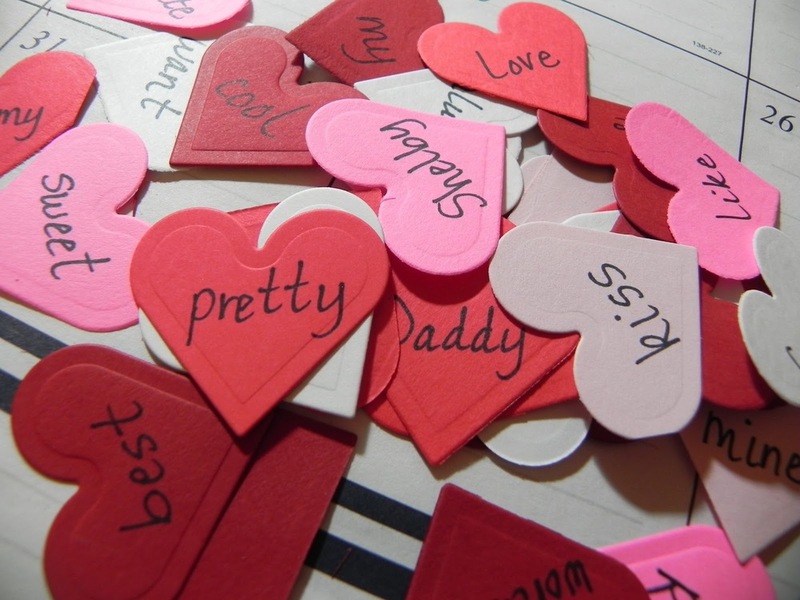 Cut out red paper hearts with a word on each. All together they should create a Valentine’s sentence or phrase such as: “Will you be my Valentine?” or “I love you a million candy hearts”. Then hide them throughout the house and have your child find them and put them together like a puzzle. If your child is old enough, they can help you put together this little scavenger hunt for your spouse. Have your child help you plant a flower (perhaps a red or pink one), preferably indoors for now. You two can work together to love and nurture it through the winter, and have the seedling ready to plant come spring. It will symbolize the love and nurturing you show to your child everyday, and teach them about care and responsibility. Take your little one to a florist or even your garden if the weather permits and have them pick the flowers they like best. You can put all their choices into a bouquet and repeat this simple, but beautiful habit every year. Newer PostMy Top 3 FAQs - Answered!